For all the goodness of turkey pot pie without the fussy pie crust, turkey pot pie casserole is the way to go! 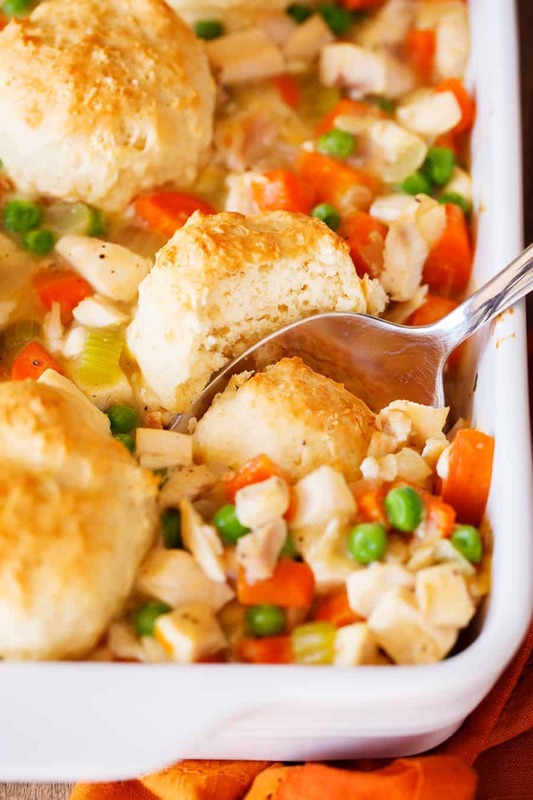 Bits of turkey and vegetables swimming in a thick and savory sauce, all topped with balls of biscuit-like dumplings. How could you go wrong? Dad was a wiz in the kitchen and loved to experiment! We had this amazing dish one lazy Sunday afternoon when everyone was hungry but no one wanted to cook. It’s been a tradition ever since! I will make this all year long, but it is especially good a few days after Thanksgiving or Christmas dinner when the family is still together. The recipe calls for 2 1/2 cups of turkey, but you can use whatever you have on hand. 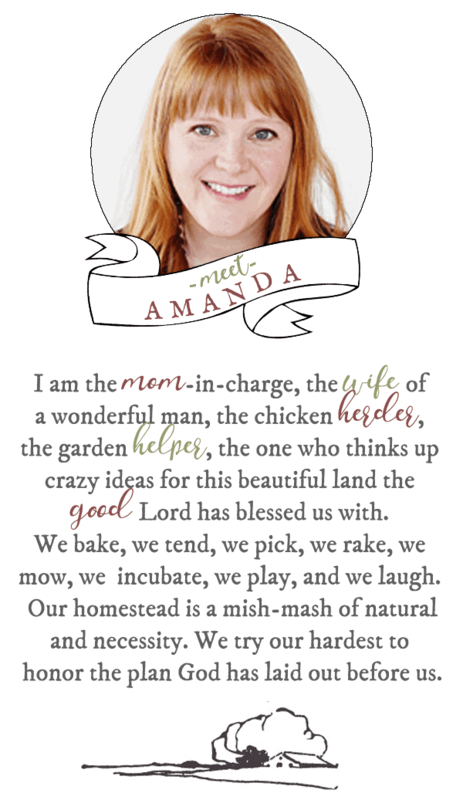 We have used as little as a cup (and added more veggies) and as much as 4 cups. You can add other veggies like Brussel sprouts and asparagus if you also have those left over from Thanksgiving dinner. Try brushing the bread with garlic butter right out of the oven. This is an amazing way to add even more flavor to this dish. 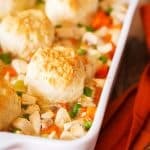 I know you will love Dad’s Turkey Pot Pie Casserole as much as we do! In a large pot over medium heat, heat the oil until shimmering. Saute the onion, carrots, and celery until softened. Stir in the flour until no lumps remain. Add in about 1/4 cup of broth and stir until thick sauce forms. Add the remaining broth and bring to a boil. Reduce the heat to a simmer and allow to simmer until thickened, about 10 minutes. Remove from the heat and stir in the turkey and peas. Season with salt and pepper to taste. 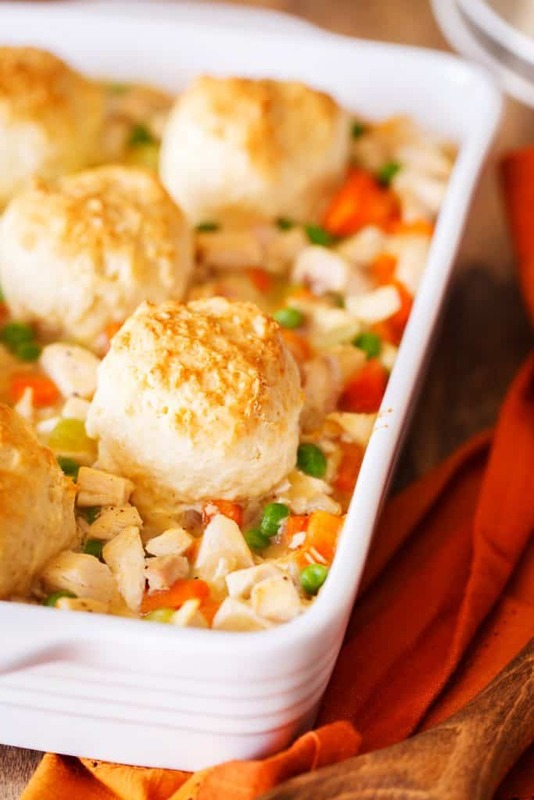 Pour into an 8x11-inch baking pan and set aside. Make the topping by whisking together the flour, baking powder, and salt. In a separate small bowl, beat together the egg and milk. Pour into the flour and stir to combine. It should be a sticky dough. Drop dough of about 2 to 3 tablespoons each on top of the turkey mixture. Bake for 17 to 19 minutes, until the topping is golden brown.